Encai High Quality Foldable Waterproof Traveling Handbag Wholesale Business Shoulder Bag Best Selling Tote Bag For Clothes Organizer : Model# EC-D46 Material: 420D oxford fabric Size: 50*32*17cm Colour: pink/green/orange/coffee/blue/navy blue/royal blue/purple MOQ: 100pcs Packing: polybag/piece,200pcs/carton Delivery Time: within 2-3days Payment Terms: TT/Western union/Paypal etc. Sample Policy: the free samples will be sent to you after placing first order Product Show: Shipping Way: @by Express(UPS, FedEx, DHL, EMS, etc/door to door) @by sea or air(FOB, C&F, CIF etc) @we accept sending goods to customer's warehouse as free within the area of Yiwu Custom Service: OEM or ODM we supply a customized service,usually only your order QTY can meet with 300-500pcs,we can make your logo on bag. logo type have sticker/printing/stitching/metal logo/hangtag colour is optional acccording to customer's requirements Our Advantage: COST @we are the direct factory,so our price is the lowest price,meanwhile,our trade team have years of experence for export business,so we can supply a lower shipping cost. 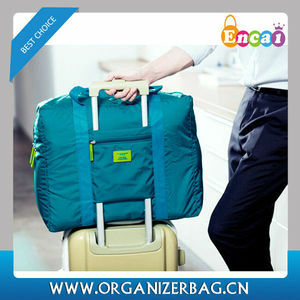 Encai High Quality Folding Traveling Handbag Wholesale Business Shoulder Bag Best Selling Tote Bag For Clothes Organizer : Model# EC-D40 Material: waterproof polyester Size: 46*20*34.5cm Colour: green/blue/orange/hot pink MOQ: 100pcs Packing: polybag/piece,200pcs/carton Delivery Time: within 2-3days Payment Terms: TT/Western union/Paypal etc. Sample Policy: the free samples will be sent to you after placing first order Product Show: Shipping Way: @by Express(UPS, FedEx, DHL, EMS, etc/door to door) @by sea or air(FOB, C&F, CIF etc) @we accept sending goods to customer's warehouse as free within the area of Yiwu Custom Service: OEM or ODM we supply a customized service,usually only your order QTY can meet with 300-500pcs,we can make your logo on bag. logo type have sticker/printing/stitching/metal logo/hangtag colour is optional acccording to customer's requirements Our Advantage: COST @we are the direct factory,so our price is the lowest price,meanwhile,our trade team have years of experence for export business,so we can supply a lower shipping cost. Yiwu Huijin Bags Co., Ltd.
1. Stylish accessory for you in everyday life 2. 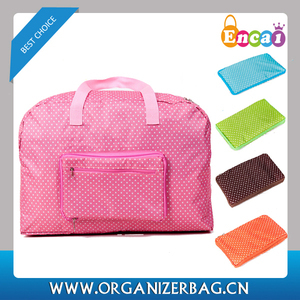 Can be folded into a mini square envelope shape, fashionable and convenient 3. 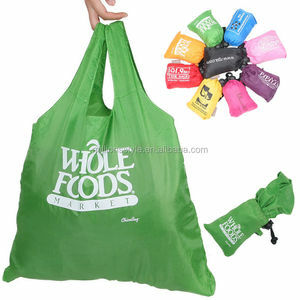 Durable and reusable, very nice item for shopping 4. 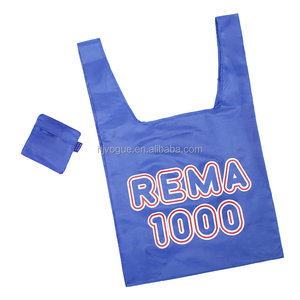 Applicable to advertising promotions, anniversary celebration, employee benefits, public relations planning, etc Product Type: Shopping bag Material: Nylon or as you want Size: 65x40x15cm Technics: Screen print OEM: Welcome Sample fee: Free MOQ 500pcs Deliver: 15-20Days Related Products Company Profile The company mainly to do what, how many people, how many classification products, can show the strength of serveral aspects, whether the advantages of productions logistics process and after-sales service. What kind of products are displayed. 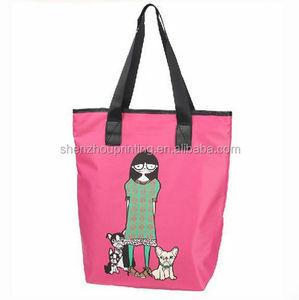 Shenzhen Promo China Gifts Co., Ltd.
2.Competitive price : Good at cost control, stable suppliers offer best cheap price . 2.OEM Service: Help you to make your idea come true ,provide you satisfied product. Fast&Cheap Delivery: Flexible for production time and find the cheapest shipping way. 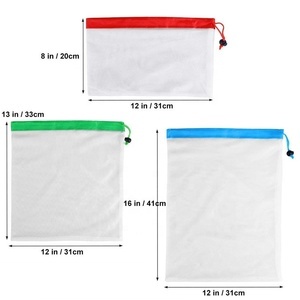 New korean version extra large polyester foldable shopping bag Name New korean version extra large polyester foldable shopping bag Item No. 2. Wholesale Orders : Normally 3-7 days according to various quantities. 3. OEM 7-10 days after receiving your sample confirmation and payment. Nanchang Xinpai Packaging Materials Co., Ltd.
Yiwu Tianqi Packaging Materials Co., Ltd.
Zibo Linzi Jingxin Plastic Co., Ltd.
Wenzhou Weisi Crafts Co., Ltd.
Shenzhen Eson Handbag Gifts Co., Ltd. Product show What Colors Can be Done9 Custom Color are All Available Please feel free to contact us for any question. Q: Can you rush my order9 A: Yes, all efforts will be made to accommodate rush order requests. Once we get your order, we will pay more attention on the production and shipping to ensure delivery of your order happens on time. Alibaba.com offers 83 encai high quality folding traveling handbag/business shoulder bag/tote bag for clothes organizer products. 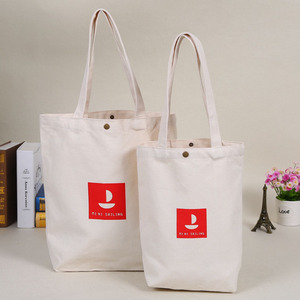 There are 3 encai high quality folding traveling handbag/business shoulder bag/tote bag for clothes organizer suppliers, mainly located in Asia. The top supplying country is China (Mainland), which supply 100% of encai high quality folding traveling handbag/business shoulder bag/tote bag for clothes organizer respectively. Encai high quality folding traveling handbag/business shoulder bag/tote bag for clothes organizer products are most popular in South Asia, Southeast Asia, and Eastern Asia.